Join us in welcoming Dr. Lyndon N. Irwin, Ph.D. to booth #125 Friday, August 23 from 3:30-4:00 PM where he will be signing his books. We look forward to seeing many of you in Fort Wayne, Indiana this year. Lyndon Irwin is an Agriculture Professor at Missouri State University. He is a member of the St. Louis World’s Fair Society and a popular speaker on World’s Fair topics. His writing about the Fair has been included in documentaries and public television programs. He is also the author of several literary works. Front cover flat of book being published. Gregath’s past President, Fredrea Cook, is ready to present her newest work – available now for preorder: The books, available individually or economically as a set, deal with many facets of the early history and genealogy of Ottawa County, Oklahoma. The volumes comprise the entire WPA interviews conducted within Ottawa County. 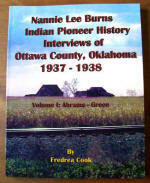 The reproduction of these oral histories provides a wonderful glimpse into the lives of those who came before. The books are slated to be ready to ship late next week. Click here to go to PayPal shopping cart. All orders this month are plus S&H of $11.00 for the first item and $2 each additional sent to single domestic address. In February, initial item fee will raise to $12.00. We do take library (only) purchase orders. 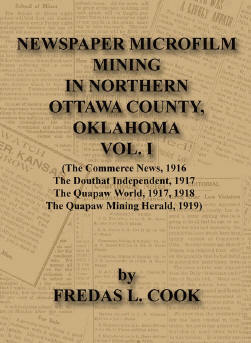 Newspaper Microfilm Mining in Northern Ottawa County, Oklahoma, Volume 1, by Fredas L. Cook, 2012. 174 pages, 8.5×11″, softbound book, ISBN 978-1-936091-20-1. 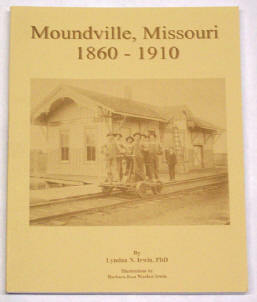 This first volume of a new series contains information from The Commerce News (1916), The Douthit Independent (1917), The Quapaw World (1917-1918), and The Quapaw Mining Herald (1919) and contains lots of information allowing a glimpse into life in northeast Oklahoma just after the turn of the nineteenth century. This fully indexed book encompasses everything from family information to advertisements and talk about the weather! Click here for book information page from publisher. Join us for an evening out on Route 66: Friday evening, September 21, 2012 join a group of genealogy and history enthusiasts for a great meal at Cafe on the Route in Baxter Springs, Kansas. A limited menu will be available by reservation only and the group will view a Route 66 slide show during the meal. 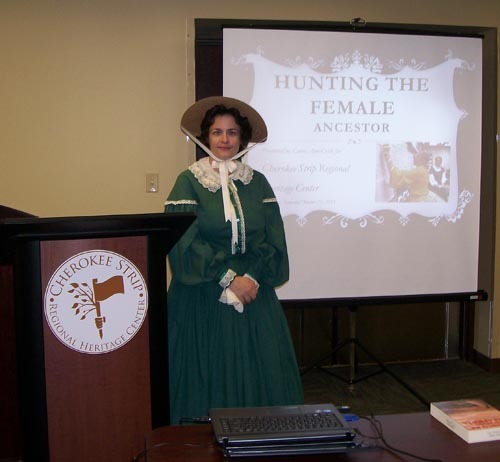 Afterwords, Carrie Cook will give a program about researching your female ancestor. If time permits, a general Q&A will follow. Reservations should be made through Gregath Company, Inc. and are only $25.00 for the entire evening. Limited seating available, and the evening is scheduled to begin at 6:00 PM. Don’t forget to mark your calendar for the next day, Saturday September 22, 2012 for the full day of free genealogy lectures at the Baxter Springs Museum! The 2012 Gregath Family History Seminar will be held Saturday, September 22, 2012 at the Baxter Springs History Center and Museum in Baxter Springs, Kansas. There is no charge to attend the lectures and no registration necessary. The national genealogy speakers on staff at the Gregath Company, Incorporated would like to help you be a successful family researcher. In this economy, many researchers are forgoing attending these types of events because they feel the cost of attendance is too high. While the information you gain and networking available pays dividends far into the future, Gregath Company understands this way of thinking. We hope a day of free seminars and face to face networking will enrich everyone’s lives and researching skills. New book on Narcissa, Oklahoma coming out soon! Years in the making, the much anticipated release of the first book dealing with the history and people of the Narcissa area is now in the hands of the publisher. Printed in very limited edition, this book will soon be available. The large format, softbound book contains families of the Narcissa area, early history, newspaper items, photos, maps and index. All mailed orders are charged $10 for the first item and $2 each additional for USPS Priority S&H. Part of a genealogy or history related service or social organization? Consider having an ancestor round table. Everyone bring their knowledge and an ancestor. In turn, each give a brief case study of the ancestor and ask for suggestions of your fellows. If you have enough members interested, it could even be open to the public as a membership event, or fund raiser.